Oskari holds a B.Sc. in Mechanical Engineering and M.Sc. in Naval Architecture from Helsinki University of Technology with majority of studies concluded at the Federal University of Rio de Janeiro. 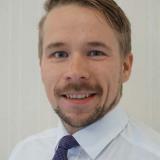 Oskari coordinates Bumi Armada's FPSO Business Development and Sales activities in Africa, Europe and South America. Prior to joining Bumi Armada, he has worked in various roles at marine engineering house, Deltamarin, lastly as Director of Offshore business. Check out the incredible speaker line-up to see who will be joining Oskari .